This workshop focused on the use of Mukurtu Content Management System (CMS) in tribal archives, libraries and museums. 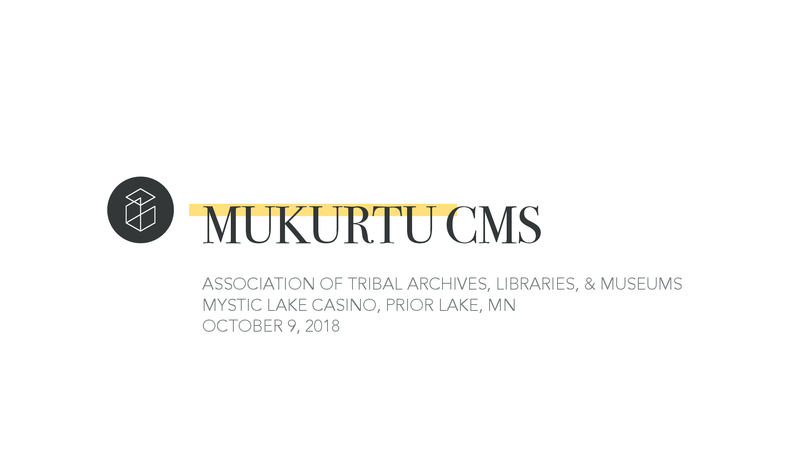 Mukurtu CMS, developed with funding from the Institute of Museum and Library Services, is a free content management system that allows communities to preserve, share, manage, license and curate digital heritage and stories using their own cultural protocols, languages and social values. In this workshop, participants received hands-on training in setting up a Mukurtu site, implementing Mukurtu's core features including a dictionary and mobile application, and the step-by-step procedures to curate digital heritage items utilizing Mukurtu CMS. Examples of Mukurtu in use in communities emphasizing preservation strategies, cultural protocols and the use of the Traditional Knowledge Labels was provided. Participants were encouraged to bring digital media to use during the workshop. Instructors: Kim Christen, Mukurtu Project Director, Director of Digital Initiatives, College of Arts and Sciences, Washington State University; Alex Merrill, Head of Systems and Technical Operations Washington State University Libraries, Washington State University; Michael Wynne, Digital Applications Librarian, Washington State University Libraries, Washington State University.